Polymeric materials are widely used in the construction of buildings and structures for various purposes. 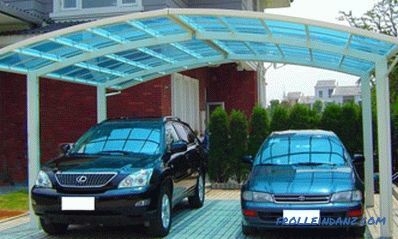 Cellular polycarbonate is a two- or three-layer panel with longitudinal stiffeners located between them. The cellular structure provides high mechanical strength of the sheet with a relatively small specific weight. To understand and understand all the technical characteristics of cellular polycarbonate, consider its properties and parameters in more detail. 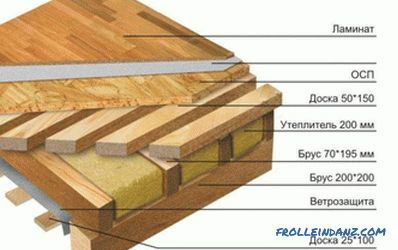 In cross-section, the sheet resembles a cell of rectangular or triangular shape, hence the name of the material itself. The raw material for it is granulated polycarbonate, which is formed as a result of the condensation of polyesters of carbonic acid and dihydroxy compounds. The polymer belongs to the group of thermoset plastics and has a number of unique properties. Industrial production of cellular polycarbonate is carried out using the technology of extrusion from granular raw materials. Production is carried out in accordance with the technical specifications TU-2256-001-54141872-2006. This document is also used as a guide for material certification in our country. 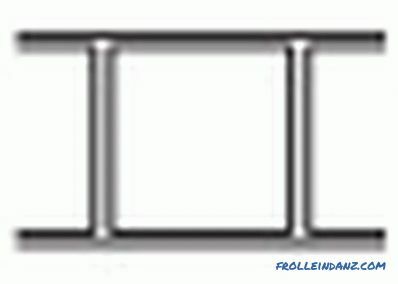 The main parameters and linear dimensions of the panels must strictly comply with the requirements of standards. 2H - Two-layer with rectangular cells. 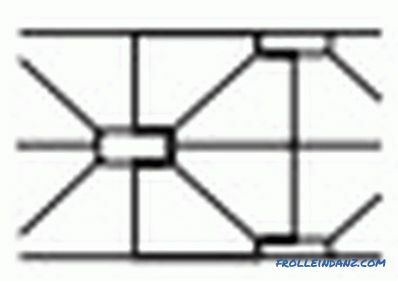 3X is a three-layer structure with a combination of rectangular cells with additional inclined partitions. 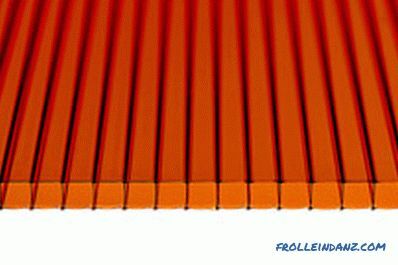 3H - three-layer sheets with a rectangular honeycomb structure, produced in 6, 8, 10 mm thick. 5W - five-layer sheets with a rectangular honeycomb structure, as a rule, have a thickness of 16 - 20 mm. 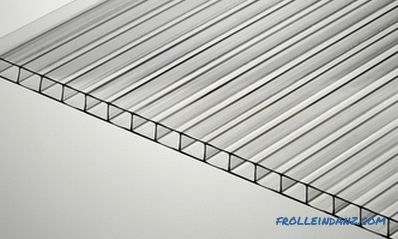 5X - five-layer sheets consisting of both straight and slanted ribs are 25 mm thick. 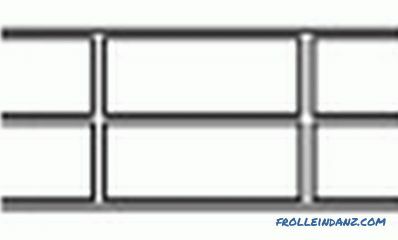 It is allowed to produce panels with other parameters besides those specified in the technical specifications in agreement with by the customer. 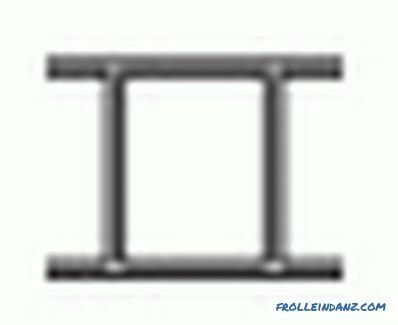 The thickness of the ribs is determined by the manufacturer, the maximum tolerance for this value is not set. Polycarbonate has an extremely high resistance to adverse environmental conditions. Temperature conditions of operation are directly dependent on the brand of the material, the quality of raw materials and compliance with production technology. 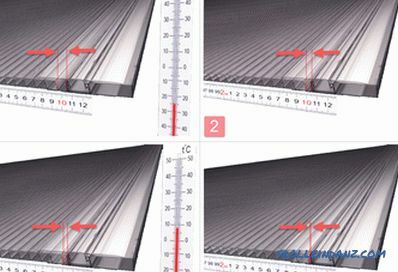 For the overwhelming majority of types of panels, this figure ranges from -40 ° C to + 130 ° C.
Some types of polycarbonate are able to withstand extremely low temperatures to -100 ° C without destroying the structure of the material. When the material is heated or cooled, its linear dimensions change. The coefficient of linear thermal expansion for this material is 0.0065 mm / m - ° C, determined in accordance with DIN 53752. The maximum allowable expansion of cellular polycarbonate should not exceed 3 mm per 1 m, both in length and width of the sheet. 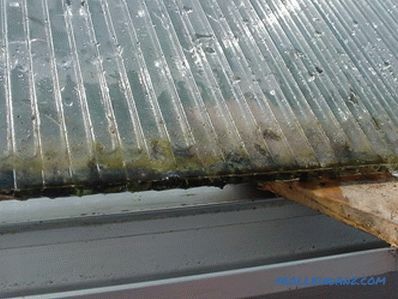 As you can see, polycarbonate has significant thermal expansion, which is why it is necessary to leave the corresponding clearances when installing it. Changes in the linear dimensions of cellular polycarbonate depending on the ambient temperature. 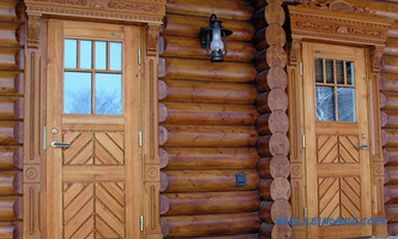 The panels used for decoration are exposed to a variety of destructive factors. Cellular polycarbonate is highly resistant to most chemical inert substances and compounds. 1. Cement mixes and concrete. 5. Sealants based on ammonia, alkalis and acetic acid. 6. Halogen and aromatic solvents. 2. Saline solutions with neutral and acid reaction. 3. Most types of reducing and oxidizing agents. 4. Alcohol solutions, with the exception of methanol. When mounting the sheets, you should use silicone sealants and specially designed for them sealing elements like EPDM and analogues. Panels, due to their honeycomb structure, are capable of withstanding considerable loads. However, the surface of the sheet is subject to abrasion during prolonged contact with fine particles such as sand. Scratches may occur if touched with rough materials of sufficient hardness. The mechanical strength of polycarbonate depends largely on the brand and structure of the material. The testing of cellular polycarbonate in terms of strength is carried out in accordance with ISO 9001 : 9002. The manufacturer guarantees the preservation of operational characteristics for at least five years, provided that the sheets are installed correctly and special fasteners are used. The production technology provides the possibility of producing honeycomb polycarbonate of various sizes. 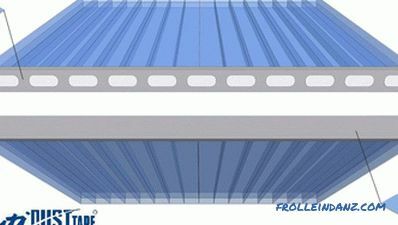 Currently, the industry produces panels with a thickness of 4, 6, 8, 10, 16, 20 and 25 mm with different internal structure of the panels. The density of polycarbonate is 1.2 kg / m 3, determined according to the measurement method provided by DIN 53479. 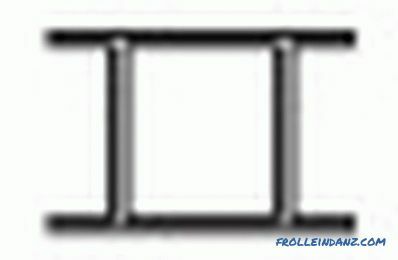 For panels, this indicator depends on the panel thickness, as well as the number of layers and the pitch of the ribs and the cross-sectional area . Characteristics of cellular polycarb Onat able to provide reliable protection against severe radiation in the UV range. 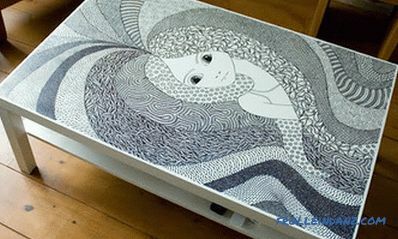 To achieve this effect, a layer of special stabilizing coating is applied on the sheet surface using a coextrusion method. This technology is guaranteed to ensure the minimum lifetime of the material for 10 years. In this case, the detachment of the protective coating during operation does not occur because of the fusion of the polymer with the base. When installing the sheet, you should carefully inspect the marking and correctly orient it. The UV protection coating must face outward. 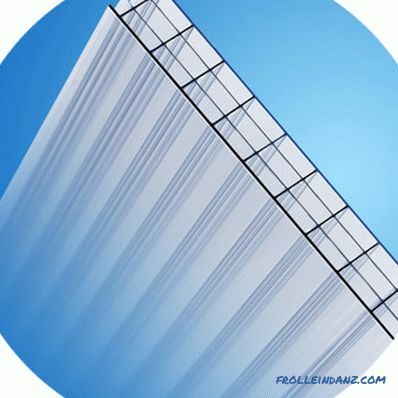 Light transmission panel depends on its color and for unpainted sheets, this figure ranges from 83% to 90%.Transparent colored panels let in no more than 65%, while polycarbonate perfectly diffuses the light that passes through them. Cellular polycarbonate has very decent thermal insulation characteristics. Moreover, the heat resistance of this material is achieved not only due to the fact that inside it contains air, but also because the material itself has a greater thermal resistance than glass or PMMA of the same thickness. The heat transfer coefficient, which characterizes the thermal insulation properties of the material, depends on the thickness and structure of the sheet. It ranges from 4.1 W / (m² · K) (for 4 mm) to 1.4 W / (m² · K) (for 32 mm). Cellular polycarbonate is the most acceptable material, where you need to combine transparency and high thermal insulation. 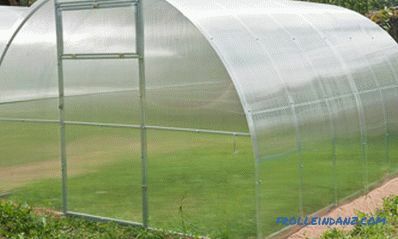 That is why this material has become so popular in the production of greenhouses. 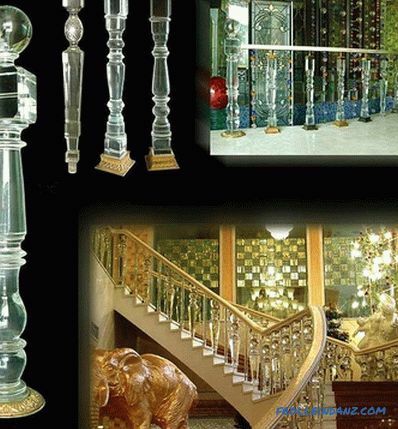 Polycarbonate is characterized by resistance to high-temperature influences. This material belongs to category B1, which is characterized by the European classification as self-extinguishing and flame-resistant. When burning polycarbonate does not emit toxic gases and dangerous to humans and animals. Under the action of high temperature and an open flame, the structure is destroyed and through holes are formed. The material is significantly reduced in area and is removed from the heat source. The appearance of holes provides for the removal from the fire source of combustion products and excess heat. Manufacturers of cellular polycarbonate guarantee the preservation of the basic technical characteristics of the material for a service life of up to 10 years, subject to the rules of installation and maintenance. The outer surface of the sheet has a special coating that provides UV protection. 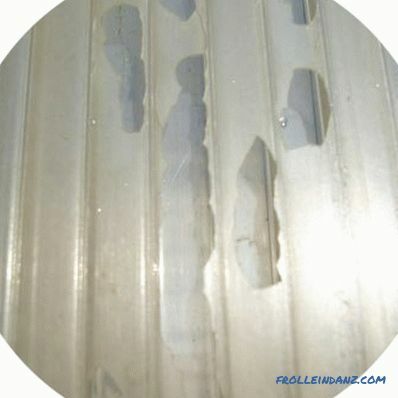 Damage to it significantly reduces the life of the panel and leads to its premature destruction. In places where there is a risk of mechanical damage to polycarbonate, sheets with a minimum thickness of 16 mm should be used. When installing the panels, the need to exclude contact with substances whose prolonged exposure contributes to their destruction is taken into account. The cellular structure of polycarbonate contributes to the low acoustic permeability of the material. 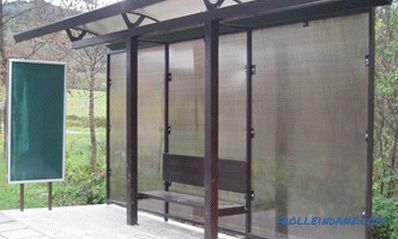 The panels have a pronounced noise-insulating property, which directly depend on the type of sheet and its internal structure. 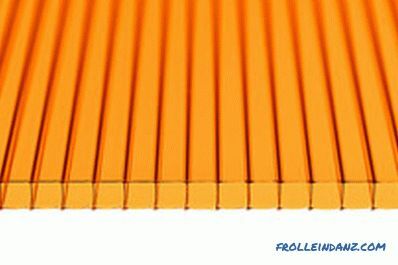 Multilayer cellular polycarbonate with a thickness of 16mm and more ensures the extinction of sound waves in the range of 10-21 dB. This sheet material does not pass or absorb moisture, which makes it indispensable for roofing work. 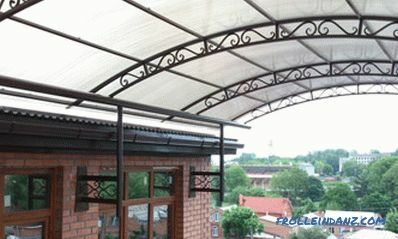 The main difficulty in the interaction of cellular polycarbonate with water lies in its penetration into the panel. Removing it without dismantling the structures is almost impossible. Long-term presence of moisture in the cells can cause its flowering and gradual destruction. In order to eliminate such developments in the installation process, you should use only special hardware with sealing elements. Edges of polycarbonate are pasted over with a special tape. The easiest way to clean the cells is to blow them with compressed air from a cylinder or compressor. The following is used to protect the edges against moisture: 1. - a special adhesive tape, 2. - a special profile that hopes over the glued tape. 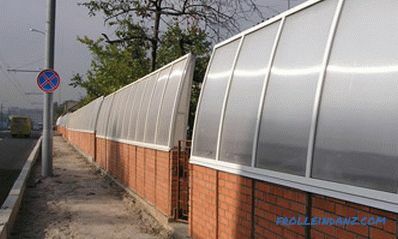 Cellular polycarbonate is supplied to the market in transparent and colored versions. 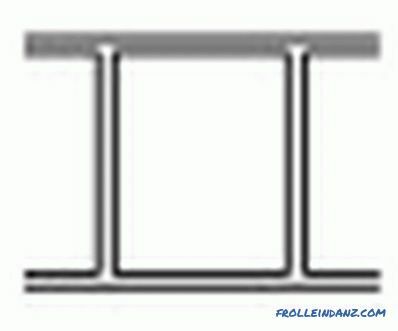 There is also a completely opaque version of the panels in silver tint . 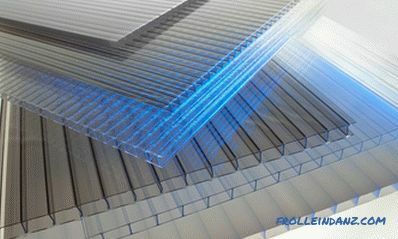 The transparency of polycarbonate depends on its thickness and its internal structure. For a transparent material, light transmission ranges from 86% for a 4 mm sheet, to 82% for a 16 mm material. Coloring of the material is carried out in an array, which contributes to the preservation of color during the entire period of operation. 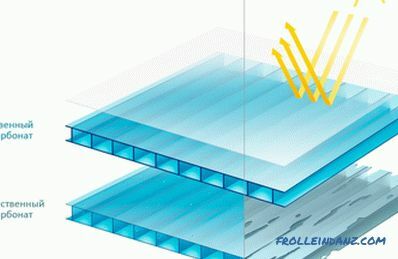 Cellular polycarbonate is mainly used in construction for the construction of roofs and walling. 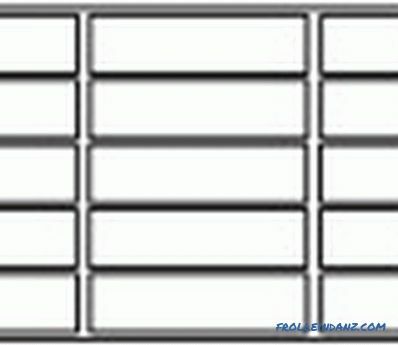 In private households, such panels are used for glazing of verandahs, mansards, arbors, or summer kitchens. 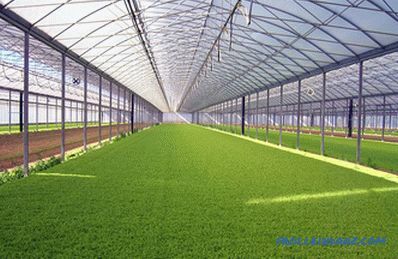 Another area of ​​application of the panels - the production of agricultural greenhouses, which are durable. 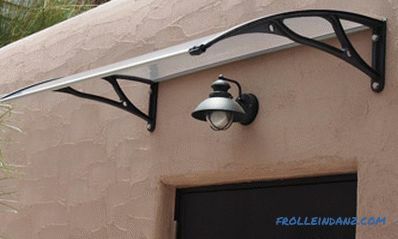 Installation of cellular polycarbonate is carried out by mounting on a frame made of steel or aluminum. 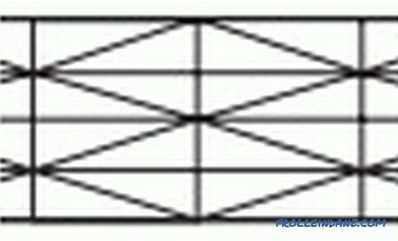 Allowed bending of sheets across stiffeners, this property is widely used in the manufacture of roofs and roofs. The minimum radius of rounding of the panel depends on its thickness in inverse relationship. 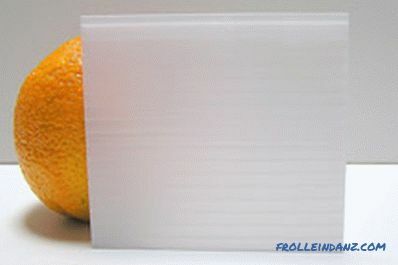 Cellular polycarbonate with a thickness of 25 mm is not subject to bending.